CARDS VS. DICE: Who shall emerge Champion?! Recently, quite a few people have asked me what system we are basing Ki-Khanga™: The Sword and Soul Role-Playing Game on. I answer that I created the game mechanic and people respond with “Oh”, “Hmm”, or with silence. Now if Gary Gygax and the boys are capable of creating a game system, why isn’t a brother from the West Side of Chicago? For those that don’t assume I am too stupid, too lazy, or too uninventive to create a viable and enjoyable game mechanic, I am next asked what type of dice we are using for resolution of actions like combat, running, jumping, building a ship, etcetera. When I answer that we are not using dice, we are using cards, I am met with either joy, pity for my soul, or outright animosity. One brother said with disgust: “Oh, another Amber.” I reminded him that Amber does not use any type of random generator. I also told him that Ki-Khanga™: The Sword and Soul RPG is not “another” anything. As an author, I take pride in my creativity. There is no need to be another Dungeons & Dragons, Tunnels & Trolls, Palladium, Vampire: The Masquerade, or any other game. We are giving the gamer a unique experience or nothing at all. My co-creators feel the same. If we were going to base our game mechanics on someone else’s we’d just create a game supplement. Because I have no desire to do what everyone else does. If I did, I would not have chosen to be an independent author and filmmaker. I would have – and could have – gone “mainstream”; I have no desire to do so. Before you dismiss me as insane, or plot my death for such sacrilege, I would like to put in my two cents for the playing card. 1. Playing Cards have a greater subtlety than dice. It doesn’t matter how many sides your die has, a 5 is just a 5. In a deck of cards, 5 could be one of two colors (red or black) or one of four suits (spades, clubs, hearts, diamonds). You can just use the 5 as a five but the color or suit could also indicate something about the particular 5 that has been drawn. 2. Playing cards also come with court cards. These unique cards (Jack, Queen and King) could be wild cards, have augmentation properties or indicate automatic successes or failures. 3. Playing cards come with a greater number of interpretations. There are 10 numbers and three courts per suit… and Jokers! 4. Dice need tables, cards only need hands. Dice need a surface to bounce off so that they can reveal their secrets. A player can sit on a couch in a room with no table and pull cards from a deck he is holding in his hands. With dice, he’d have to hunch down to roll them on the floor. Back pain…poor posture…shame. This is one thing dice can’t do. A 6 in a deck of cards could just be a six, but it also possesses a Suit and that Suit could have significant meaning. A six of diamonds could be very different from a six of clubs. You may note that the four categories described here present all sorts of possibilities for bonuses and plot effects. Anything that will give you, as the GM, a break in interpreting what a result means has to be a good thing. Suits can also denote effects on plot, characters, world events (e.g. weather) or treasures. And don’t forget that cards come in two colors. This expands the possible meanings of the Suit even further. For example, red cards could mean “yes” and black cards mean “no”. This is where cards really start to take off into a whole different stratosphere when compared to dice. No other randomizer has extra elements built in the way a pack of cards does. Here you have three cards per Suit that essentially have no numeric value. They are “special” cards. They could mean something or nothing. You can even remove them if you feel they are unnecessary. 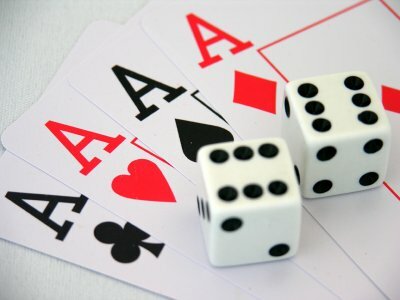 With dice, a roll of 1 is either great (on testing systems that go low) or disastrous (on testing systems that go high). Cards have tended to indicate there is something special about the number ‘one’. It’s called the “Ace”, after all – as in ‘acing’ a test, or an ‘ace’ pilot. One of the distinct problems of dice based systems is that once players are used to the system, they can tell, from a roll, what kind of result they’ve achieved. Cards allow for more flexibility in this case. Just when you thought a single randomizer couldn’t get any cooler, along comes a card without a numeric value or a suit. A card that essentially represents a kind of “all bets are off” concept. The power and versatility of the Joker card is exemplified by how the card itself has stepped out of the deck and into unrelated games like quizzes. The Joker symbolizes that some extraordinary game event has been introduced. Whether you harness this power for your own adventures is up to you. If you take a die, add another die what do you have? Well, two dice. Take a deck of cards and add a second deck of cards and you could have a couple of things – Firstly, you have one HUGE deck of cards. Secondly, you could buy two packs of cards which are of different brands. Then, you have two different decks. You could use one for straight numeric randomizing and the other as a kind of fate deck and/or fortune deck. The possibilities are many. Hopefully, I have helped to open your eyes – and mind – to the power of card decks as a randomizer in role-playing. Ki-Khanga™: The Sword & Soul RPG uses playing cards quite ingeniously for fun, exciting and versatile play. Posted by Balogun on January 27, 2012 in Adventure, atlanta, Dark Fantasy, Fantasy, Role Playing Games, Speculative Fiction and tagged africa, african, afrika, afrikan, black speculative fiction, ed hall, eugene young, game, games, ki-khanga, milton davis, playing, role, role-playing, roleplaying, stanley weaver, sword and soul. Good observation about the Lord of Rings… I look forward to reading more. I am building my campaign at the moment, starting with the world(s), history, magic system, big conflicts, powers, cultures etc, which I am going to use as a setup for my next game-book(s). i also decided of using cards (and maybe d6 also) instead of just dices. beyond the aspects that you wrote about the characteristic of cards, cards got another very unique attribute: cards have MEMORY. which means, you can decide that a certain abilities/combos/you name it, can be unleashed only if you have a certain combo of cards…this opens up some pretty amazing and endless options. and I’m using it in my own system (building stage at the moment). cards are pretty awesome…and dice are also…i think we should all keep our minds open and be creative, to come up with FUN and clever game systems :).